The adventure began mid-August when we came home from Canada to prepare our eldest child for his first year of college in faraway Colorado. We shopped and packed, even as I taught a bunch of yoga classes and reconnected with many of you Ease Yogis. Simultaneously, Baker, our 18 year old son, said goodbye to his close knit group of high school friends, sorted out what to bring and what to leave behind in his shrine of a room (priorities included his white water kayak, skis and a framed photo of his high school buddies) and thoughtfully packed the car (a skill he inherited from his mother)! Pride Pride! My emotions over this past year have gone from excitement (knowing that Baker got into his first choice school), to dread (how can he be leaving us for distant Colorado) to GET OVER IT TARA (he is so ready and excited to go). Jerry, my husband, is the ultimate cross country road tripper. He loves an adventure. We have driven across the United States three times together over the years. There is so much to see and we always make it fun! This time was no exception. Kayak strapped to the top of our rented Sienna minivan that we would drop in Denver at trip’s end, Tae, our 11 year old son, along for the ride and Riley, our 15 year old daughter at sleep away camp, the four of us set off for the long ride to Colorado Springs. Louisville, Kentucky. Hosted by some wonderful friends, we experienced southern hospitality and visited the Muhammad Ali Museum. A beautiful tribute to a man of honor, discipline, and generosity. St. Louis, Missouri. We went up The Arch to celebrate mathematicians, engineers, architects, construction workers, and great views! Kansas City, Missouri. An overnighter in a city that still celebrates the 2015 World Series win royally. Wamego, Kansas. Billboards along the highway lured us into this little town to experience the OZ Winery and OZ Museum. As a lover of The Wizard of OZ, The Wiz, and Wicked, I forced my family to stop in Wamego. The wine wasn’t spectacular but the museum’s collection of OZ memorabilia was fun. Most memorable for me was the inspiring story of Oz-author Frank Baum, a traveling gear lube salesman who decided to share his magical children’s story with the world. The themes in that famous story are so deep and so real. A trip to Target, Pier One, and Big Lots! With the final hug, I welled up with tears. I love this boy, this man, so much. We will miss him, and a little part of me will be left in Colorado. Buddhist practice speaks often of non-attachment. Mothers and fathers are put to work by this principle. Lots of yoga and meditation will help. Even as I write this, the writing itself helps ease the pain. I am thankful to have created Ease, and to have all of you in this beautiful healing and intentional community. It feels good to come hOMe, to breathe and to flow with all of you. I will eat South Block Warrior Bowls and do Warrior asana to strengthen me and to give me courage. I will attend Beth’s Cats on Mat’s to give me additional love and joy, and I will continue to study this ancient art of yoga during our upcoming teacher training with the amazing Ann Hunt, in order to grow my mind and to share with you the healing benefits of yoga. As difficult as it is to launch a child, I hope that each of our three children return to Alexandria often, knowing that there truly is no place like hOMe. A few weeks back, during a class I was leading, a very loud fire alarm sounded in the studio just as we were beginning to move into our final relaxation pose, savasana. We come to yoga for peace and serenity. That day, peace and serenity were not what we received. It was interesting to see the reactions of the students. One person flew from their mat in high distress. Many of us covered our ears as we made our way outside of the building. As the screaming sirens of ambulances and fire trucks raced toward the front entrance, many thoughts went through my mind. Outside in the sunshine and with a gentle wind blowing, we sat down on the patio tiles and closed our eyes. I decided to lead a gentle stretch and meditation. There was chaos and noise all around and, yet, we were able as a group to remain centered. After our experience we all shared. What we learned was remarkable. Many of us come to yoga for the “Fire Alarm” moments. Yoga helps us to deal with those moments when everything is not going so perfectly. When everything is peaceful and going well, it is easy to live centered and peacefully. The work is in the messiness of life. That day, we learned that all we needed to do was to slow down, to breathe deeply and to center ourselves. The practice of yoga is more difficult to get to during the chaos and the noise; however, these are the times we need it the most. And during the peaceful, easy times in our lives, our practice helps us prepare for when the fire alarms of life sound. When I was in the jungles of Costa Rica for my first yoga teacher training, one of my favorite parts of the experience was lying on my back after a physical practice, absorbing the warm air and the nature sounds, while the mesmerizing voice of my teacher lulled me into a state of deep relaxation. Sometimes I fell asleep. Other times I found myself in a profound state that wasn’t quite asleep but also wasn’t awake. I came out of these experiences with an overwhelming feeling of relaxation, of deep surrender, and a sense of coming home to myself. It was a release from my conscious thinking mind- my “hornet’s nest”- as I lovingly say. It gave my busy mind the break that it truly desires. This is the goal of Yoga Nidra... to experience the place that exists within you when the mind is not active. To access the deep layers of the subconscious mind, which is where true transformation takes place. I was hooked. I wanted more and I wanted to share it with others. Yoga Nidra has been shown to reduce anxiety, promote healthy sleep, improve body system functions, increase your sense of well-being and universal connection, and so much more. But just like with all of our yoga and meditation practices, this is a practice. Sometimes, regardless of the effort, the brain just won’t turn off. Sometimes the body simply can’t relax. It’s all part of the journey. Your first experience of Yoga Nidra (or the 10th or the 100th) may not be the magical experience you were hoping for. But with continued practice, you may just find it a little bit easier to quiet the mind, to still the body, and to experience the joy of coming home to yourself. Join Becky for Yoga Nidra on the 3rd Sunday of each month, from 7:00-8:00pm. Saturday night we celebrated Ease’s 2nd Birthday. It was a beautiful night out on the patio and many of our loyal clients and a bunch of our hard working teachers intermingled while munching on delicious Alexandria cupcakes and sipping on champagne. One particular Ease client deeply touched my heart that night. Elin, a young Swedish woman who works as an au pair here in Alexandria, is a participant in the Teen Yoga program. A few months back she entered Ease to purchase our New Client Welcome, attended classes, and soon signed up for the Teen Program. Elin’s gift to Ease the night of the party was so heartfelt and beautiful. She gave us a picture of her home village in Borensberg, Sweden and a beautifully hand written note on natural paper. For all we do at Ease, nothing excites me more or touches my heart more deeply than when our clients get why Ease exists in this world. We truly are about healing and putting a smile on your face. We want to make you feel lighter and to help lessen your worries. All of us teachers have experienced the magic of the wise, ancient yogis. We are so excited to share all we have learned with you as we enter into YEAR THREE- YIPEEEE!!!!!!!! Join us for yoga, come often and, if you are trying to entice a friend to visit Ease for the first time, we have “RANDOM ACT OF YOGA” cards for one free class for a first time visitor. We would be happy to give you a few! Simply ask a teacher. My harmonium is a Bina 23, and is made especially for traveling. It is a very popular model and brand, it has a wonderful sound. Harmoniums are quite heavy so it is not an instrument that works for everyone and every place. I started messing around on my friend's harmonium a few years ago, I bought this one last year on retreat in Sonoma. I took a one day workshop with Hari-Kirtana Dasa in DC that reviewed the basics of harmonium playing and Sanskrit chanting. Admittedly, I was the worst in the class. I use the harmonium more as a meditative tool and an accompaniment to chanting than to learn as an instrument. I love the sound of the harmonium so I create really simple melodies to chant over. How do you incorporate the Harmonium into your yoga classes? I like to use it at the beginning and sometimes, at the end of class, to teach a chant. I remember the first time I chanted. I was in Yoga Teacher Training at Yoga Landing in Chattanooga. I rolled my eyes when I was told we would chant that day. I thought, "I have no interest in this." And then we chanted- I felt amazing, I felt connected to everyone around me, and to the divine. I had never experienced anything like that. To this day, I find it absolutely blissful. Harmonium is a great tool to teach chanting because everyone can hide their voice under it if they are self-conscious. What has the response been from your yoga students? I have been pleasantly surprised with the response from my students. I was always fearful students would feel too much pressure to sing or be spiritual when I led chanting. However, over the past year, more and more students have tried it and even requested it! I love chanting with other people, it is such a wonderful way to remember why we practice yoga- to feel connection. Who am I? Where have I been? Where am I going? What is my purpose? Approximately eight years ago, my spiritual healer asked me to answer these questions. We were moving as a family to Costa Rica and Kourosh saw this as a great opportunity to explore the big spiritual questions. “Can I simply start with the first one?” I asked. And so began my quest. A big reason why Ease Yoga & Cafe exists today is thanks to Kourosh Kashani. Little did I know at that time that the move to Costa Rica would lead to my becoming a yoga teacher and studio owner by embarking on the 200 hour yoga teacher training at the Nosara Yoga Institute. There was my first question! From this point, many events followed to lead me to my work and purpose today. Sharing the wisdom of yoga and helping individuals make the mind body connection through breath has been amazing to witness. I have learned so much from our teachers, our students, and from the community all around us. 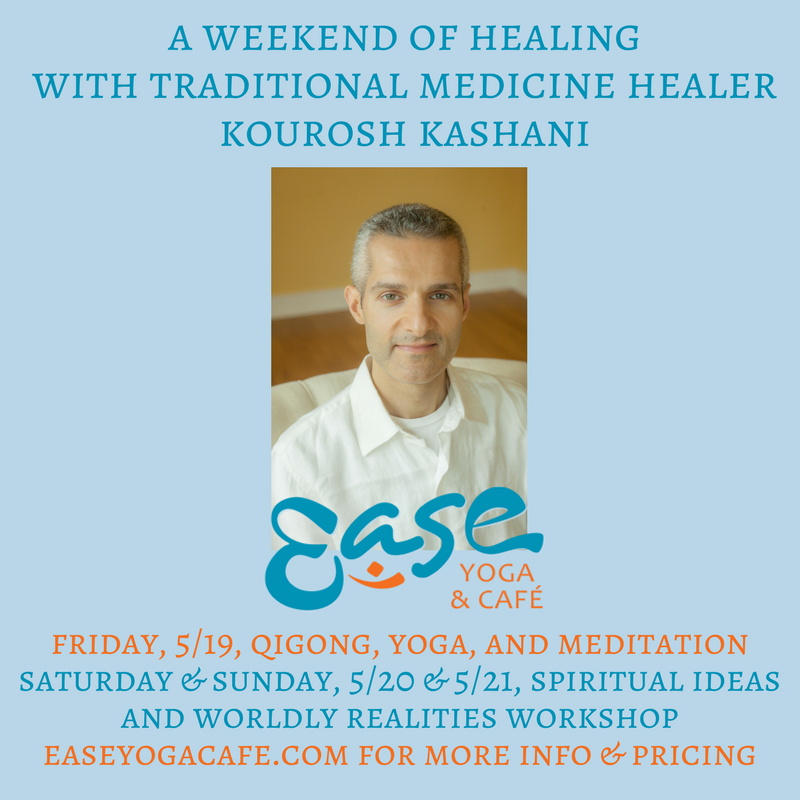 Entering into our third year of business, Ease Yoga & Cafe is proud to host Kourosh and to bring all of his spiritual wisdom of healing to our community. Kourosh has taught all around the world. He recently presented at Google in California and he will be featured in a movie to be released this spring. Kourosh truly is wise. He is a healer in the greatest sense of the word. Please join him this month for his class and workshops. It is a gift to yourself that you will not regret. If you are ready to move deeper and explore the big questions please join us. Click HERE for more information and registration. You can also connect with Kourosh or set up private sessions during his stay the following week by contacting him through his website. In a meeting this week, a wise friend shared that it is important, when building a brand, to make a promise and keep a promise. This got me thinking. What is the Ease Promise? For us, it was Ease-y to come up with this list. We hope that all of us at Ease are keeping our promise to you, that you feel all of these promises in your body, and that you feel safe to explore your own unique self and all its amazingness. This practice of yoga is such an interesting journey. The ancient yogic wisdom is now being proven by science: slow down, breathe, connect mind & body, and listen to the feedback from the body, and wonderful things begin to happen. There are days when you may want a more gentle practice to restore your energy and to calm your mind, and there are days when you may need to move and breathe and be strong. We offer all of that here at Ease. We have amazing teachers that you can trust and who can hold space for you to explore, learn, and connect. These promises encapsulate what I strive for in myself each day. Make your own list of your promises to yourself. Write them down and strive to keep those promises. From this you begin your journey to a loving and intentional life. With the explosion of yoga in the West, there’s been an influx of yoga styles, each expressing their own blend of breathing, poses, meditation, chanting, relaxation, and philosophy. Restorative yoga, a practice that leads the yogi toward a more healing and recuperative experience, ushers in a host of wonderful benefits that are often overshadowed by the popularity and visibility of more dynamic yoga styles. A restorative practice frequently relies on the use of props and the prolonged holding of a few simple poses to achieve a deep level of relaxation. “Restorative yoga” can also be an umbrella term that encompasses several sub-styles of relaxation and healing-based Hatha yoga practices, such as the Seven Spiritual Laws of Yoga. It’s time to roll out your yoga mat and discover the combination of physical and mental exercises that for thousands of years have hooked yoga practitioners around the globe. The beauty of yoga is that you don’t have to be a yogi or yogini to reap the benefits. Whether you are young or old, overweight or fit, yoga has the power to calm the mind and strengthen the body. Don’t be intimidated by yoga terminology, fancy yoga studios and complicated poses. Yoga is for everyone. The building blocks of yoga are poses. These are good ones to learn as you build a regular yoga practice. These 10 poses are a complete a yoga workout. Move slowly through each pose, remembering to breathe as you move. Pause after any pose you find challenging, especially if you are short of breath, and start again when your breathing returns to normal. The idea is to hold each pose for a few, slow breaths before moving on to the next one. Do it: When you want to get a nice gentle stretch through your neck spine and hips. Skip it: If you have knee injuries or ankle problems. Avoid also if you have high blood pressure or are pregnant. Modify: You can rest your head on a cushion or block. You can place a rolled towel under your ankles if they are uncomfortable. Be mindful: Focus on relaxing the muscles of the spine and lower back as you breathe. This should be your go-to pose whenever you need to rest for a moment during a yoga workout. Downward-facing dog strengthens the arms, shoulders and back while stretching the hamstrings, calves and arches of your feet. It can also help relieve back pain. Do it: To help relieve back pain. Skip it: This pose is not recommended if you have carpal tunnel syndrome or other wrist problems, have high blood pressure or are in the late stages of pregnancy. Modify: You can do the pose with your elbows on the ground, which takes the weight off your wrists. You can also use blocks under your hands, which may feel more comfortable. Be mindful: Focus on distributing the weight evenly through your palms and lifting your hips up and back, away from your shoulders. This is one of the most common yoga poses. A commonly seen exercise, plank helps build strength in the core, shoulders, arms and legs. Do it: Plank pose is good if you are looking to tone your abs and build strength in your upper body. Skip it: Avoid plank pose if you suffer from carpal tunnel syndrome. It can be hard on your wrists. You might also skip it or modify if you have low back pain. Modify: You can modify it by placing your knees on the floor. Be mindful: As you do a plank, imagine the back of your neck and spine lengthening. This common pose can build strength in the core, shoulders, arms and legs. This push-up variation follows plank pose in a common yoga sequence known as the sun salutation. It is a good pose to learn if you want to eventually work on more advanced poses, such as arm balances or inversions. Do it: Like plank, this pose strengthens arms and wrists and tones the abdomen. Skip it: If you have carpal tunnel syndrome, lower back pain, a shoulder injury or are pregnant. Modify: It’s a good idea for beginners to modify the pose by keeping your knees on the floor. Be mindful: Press your palms evenly into the floor and lift your shoulders away from the floor as you hold this pose. This pose builds strength in the arms, shoulders, wrists and back and helps tone the abdomen. This back-bending pose can help strengthen the back muscles, increase spinal flexibility and stretches the chest, shoulders and abdomen. Do it: This post is great for strengthening the back. Skip it: If you have arthritis in your spine or neck, a low-back injury or carpal tunnel syndrome. Modify: Just lift up a few inches, and don’t try to straighten your arms. Be mindful: Try to keep your navel drawing up away from the floor as you hold this pose. One of the simpler back-bending poses. Beyond helping improve your balance, it can also strengthen your core, ankles, calves, thighs and spine. Do it: Great for working on your balance and posture. Skip it: You many want to skip this pose if you have low blood pressure or any medical conditions that affect your balance. Modify: Place one of your hands on a wall for support. Be mindful: Focus on your breath in and out as you hold this pose. This balancing pose is one of the most recognized poses in modern yoga. Triangle, which is a part of many yoga sequences helps build strength in the legs and stretches the hips, spine, chest, shoulders, groins, hamstrings and calves. It can also help increase mobility in the hips and neck. Do it: This pose is great for building strength and endurance. Skip it: Avoid this pose if you have a headache or low blood pressure. Modify: If you have high blood pressure, turn your head to gaze downward in the final pose. If you have neck problems, don’t turn your head to look upward; look straight ahead and keep both sides of the neck long. Be mindful: Keep lifting your raised arm toward the ceiling. It helps keep the pose buoyant. This pose can be found in many yoga sequences. This twisting pose can increase the flexibility in your back, while stretching the shoulders, hips and chest. It can also help relieve tension in the middle of your back. Do it: To release tight muscles around the shoulders and upper and lower back. Skip it: If you have a back injury. Modify: If bending your right knee is uncomfortable, keep it straight out in front of you. Be mindful: Lift your torso with each inhale, and twist as you exhale. Want to relieve the tension in your back? Try this twisting pose. This is a back-bending pose that stretches the muscles of the chest, back and neck. It also builds strength in the back and hamstring muscles. Do it: If you sit most of the day, this pose will help you open your upper chest. Skip it: Avoid this pose if you have a neck injury. Modify: Place a block between your thighs to help keep the legs and feet in proper alignment. Or you can place a block under your pelvis if your lower back is bothering you. Be mindful: While holding this pose, try to keep your chest lifted and your sternum toward your chin. This pose, from the back-bending family of yoga poses, is great for stretching the muscles of the chest. Like life, yoga classes typically end with this pose. It allows for a moment of relaxation, but some people find it difficult to stay still in this pose. However, the more you try this pose, the easier it is to sink into a relaxing, meditative state. Do it: Always! Skip it: If you don’t want to have a moment’s peace. Modify: Place a blanket under your head, if that feels more comfortable. You can also roll up a blanket and place that under your knees, if your lower back is sensitive or bothering you. Be mindful: Feel the weight of your body sinking into your mat one part at a time. Though it may not look difficult, it can be quite challenging to lie in corpse pose for an extended period of time. Yoga became an essential part of my life after developing anxiety and a terrible fear of dying after one of my dear colleagues got killed while I lived and worked in Pakistan in 2014. One year later, I went to India for a month-long Yoga teacher training to focus on dealing with my anxiety and fears. During that time, I found many inspirations in Yoga philosophies, ancient Indian scripts, and in my Yoga and Pranayama (breath awareness) practice. Yoga taught me how to make it through painful and complicated poses as well as moments in life by breathing calmly and naturally. Through Savasana (final resting pose), I accepted the fact that just like everyone else, I will die one day and that it could happen anywhere at any time. Bakasana (crow pose) taught me the strength to overcome fear and that I can do anything if I believe in myself. Vrksasana (tree pose) had a calming effect on me and made me realize how important it is to be present. Over time my anxiety left and I started appreciating all the tiny beautiful moments of life each day. I started asking the big questions. Am I living the way I want? Am I doing everything to fulfill my dreams? Am I doing something meaningful each day? Am I spending enough time with my beloved ones? After all, Pakistan lead me towards the path of Yoga. Furthermore, my time over there made me switch my career path, and on a cold rainy night in Islamabad I met my American husband. I am thankful for all of that. 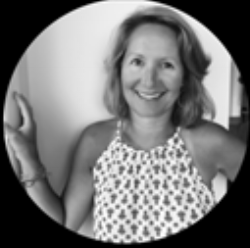 Last summer, I pulled up my stakes in my home country of Germany, moved to beautiful Del Ray together with my husband, and became a member of Ease. Now, I do a job I love, working with the Ethiopian Community Development Council (ECDC), one of the nine refugee resettlement agencies in the US. We take care of newly arrived refugees from all over the world during their first 90 days and provide long-term intensive case management to especially vulnerable people. Many of them have been forced to leave their homes and lived through years of hardship surviving in refugee camps. Some are victims of torture or lost all of their family members. Their long journey seems to be over when they finally arrive in the US, but over here new challenges are waiting for them. One of many projects at ECDC is leading a support group for Breast Cancer Survivors. The 14 beautiful women between the age of 30 and 65 meet once a month to share their stories, to go on field trips, and participate in workshops. Most of them are from Ethiopia and have lived in the US a short time. They have not just been through the hardship of being a refugee, but additionally fought cancer for many years of their life. They are some of the strongest and most inspiring women I have ever met. I have the wonderful opportunity to start a Gentle Yoga class specifically for them at the end of this month. It has been proven that Yoga is helpful for Cancer patients during all stages of treatment and afterwards, as it improves physical symptoms, like pain and fatigue, and reduces stress and anxiety. The Yogic breath, for example, has a positive effect on the immune system and gentle movements release endorphins, our happiness hormones. I hope that regular classes will be beneficial to each and every woman of ECDC’s Cancer Survivor Group and I am very excited to finally share the healing powers of Yoga with some of the people who need it the most. EASE is collecting gently used yoga mats for Sophie's Cancer Survivor group at the studio. Please feel free to drop off donations with us anytime. There are so many things that we have in common as human beings. Remembering those positive things that connect us is just plain good for our health! In my humble opinion, I would guess most of us have some kind of heightened emotions at this moment in time. Too many adjectives to list here but a few simple ones might include, excitement, anger, empowerment, fear, sadness, happiness, etc. I am not writing to judge your “emotions” but to suggest we all have emotions, yes? I’m sure at some point recently you have observed heightened emotions. How about the compassion to acknowledge is it a commonality in human beings and that affects our daily lives, our health, AND those around us? Often we get so caught up in our own drama and emotions that we begin to actually create “dis-ease” in our bodies and can become disease. Many of us already have stressors, like long work hours, daily responsibilities that contribute to little sleep, little exercise and no time for inspiring human connection like (church, girlfriends, family time, couple time, just walking down the street without a mission to get somewhere). In my yoga classes this month the theme is self-observation or self-study. To be aware and notice this idea of Think less and FEEL more! Using observation to become aware of your behavior, your interactions, and decisions, to determine what feels healthy and what does not. Observations like how it feels when you are around certain people? Do they inspire you or tire you? How you react when plans change abruptly, noticing your morning routine, how you carry yourself as you walk? Very simple observations tell the story of who we are in those moments. Notice and observe, no judgment, just inquiry. Then you will have more authentic information to create “re-SOUL-utions” or intentions as we say in yoga. This may allow us to disentangle ourselves from aspects of our life that don’t create “well-being”.